For my prototype, I am using Mininet included in the OpenFlow VM to simulate 2 filter switch (s1 and s2) with 5 hosts each (h1-h5 on s1, h6-h10 on s2), 5x uplinks to aggregation switch (s3), and a capture host (h11) attached to Eth11 on s3. The Red link indicates the 'always forward' state. For example, eth6 will always forward to eth1 on s3 and s3 will always forward all traffic from eth1-10 to eth11 to the capture host. On s1, (port 1 / port 2) and (port 3 / port 4) will always forward traffic to each other. On s2, (port 1 / port 2) will forward traffic to each other. Switch s1 traffic on eth1 will be mirrored to eth6 and switch s2 eth2 traffic will be mirrored to eth7. To keep things simple, only 1 link on the mirrored is picked so I dont see the same traffic multiple times and eth3/eth4 traffic on s1 is not mirrored to show isolation. # Even a simple usage of the logger is much nicer than print! As you can see from the code, I have moved the mirror port source and destination into a separate file so they can be changed independent of the code. 1. 2x port Filter Switches with 5 hosts and 5 trunk ports. POX 0.1.0 (betta) / Copyright 2011-2013 James McCauley, et al. INFO:core:POX 0.1.0 (betta) is up. 3. 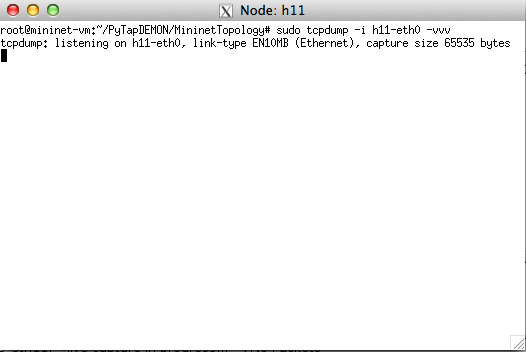 Launch Wireshark and starts to capture on s3-eth11. 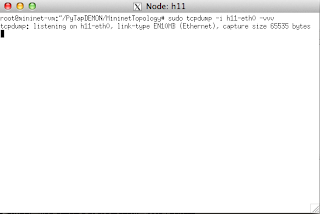 PING 10.0.0.7 (10.0.0.7) 56(84) bytes of data. PING 10.0.0.4 (10.0.0.4) 56(84) bytes of data. The next step for me is to add a web frontend for users to indicate the desired mirrored port. I will do a separate post to dissect the POX component code. My latest book Mastering Python Networking Second Edition (Amazon Link) is out! I want to thank everybody involved that made it a reality. All of my proceeds from the book will be donated to Charity. You can find the first edition here. You can find the O'Reilly DDoS book (co-authored with Rich Groves) here. Disclaimer: The opinions expressed here are entirely my own. Unrelated to my employer or anybody else. I am a Packet Pusher. Love network automation using Python. Ex-CCIE 22460 R&S. Experienced in major cloud provider datacenters and enterprise IT networking. Copyright 2016 Network Automation Nerds. Simple theme. Powered by Blogger.